The nose is the most commonly broken bone in the head. Broken noses are almost always the result of trauma to the face. Symptoms include pain, visible deformity, bloody nose and in severe cases difficulty breathing and bruising around the eyes or "black eyes." A broken nose can cause a deviated septum. Do not move if it is possible that there could be damage to your neck or spine. Have someone else call 911. If your neck is okay lean forward and gently pinch the nostrils together. This will help to stop the bleeding and prevent blood from running into the back of the throat and being swallowed. Apply a cold compress to help control pain and swelling. You may use acetaminophen to control pain or a doctor may prescribe something stronger. Inform your doctor of any over-the-counter pain relievers you took before coming to the clinic or ER. 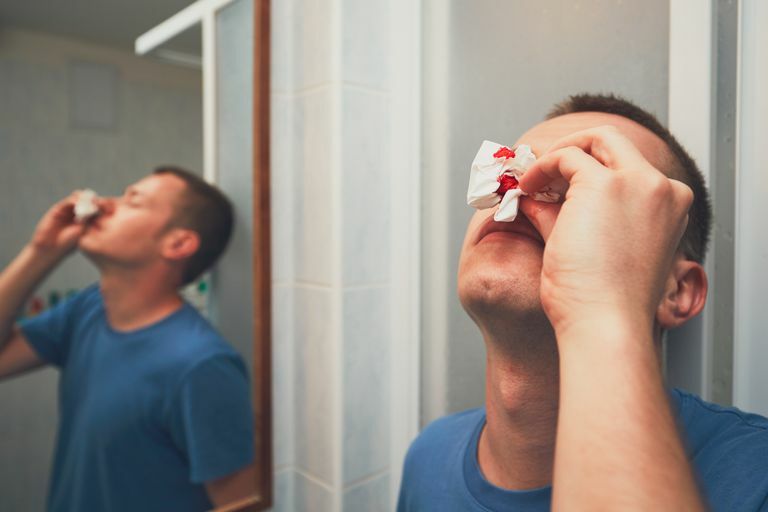 When Is a Broken Nose an Emergency? All known or suspected broken noses should be checked out by a doctor to rule out serious complications. Other serious injuries are suspected, especially injuries of the spine or neck. A significant amount of clear fluid is draining from the nose. There are large blood clots present. The tissue of the nose turns black. It may be surprising to know that x-rays are not particularly helpful in diagnosing and treating broken noses. The diagnosis is typically made based on the appearance of the nose and whether or not you are having difficulty breathing. Medical imaging such as x-rays or CT scans is sometimes done to rule out other fractures of the head or neck, depending on the injury. Many fractures do not need to be repaired but just need time to heal. Your doctor may recommend light activity, particularly avoiding any activity that could result in a facial injury for about six weeks while the nose heals. You must be very careful during this time that your nose it not bumped or hit. The bone will be reset only if there is obviously physical deformity, or the fracture is interfering with breathing. If the bone does need to be reset there are a couple of options depending on the situation. In some cases, the bones can be reset in the doctor's office with a local anesthetic. The bones are then held in place with a cast which remains in place for about a week. There are some serious complications in the case of broken noses. A septal hematoma (a blood-filled abscess) may form (most often within 24-48 hours of the injury) and if it is not drained in a timely manner can result in tissue death and actually cause the nose to collapse.